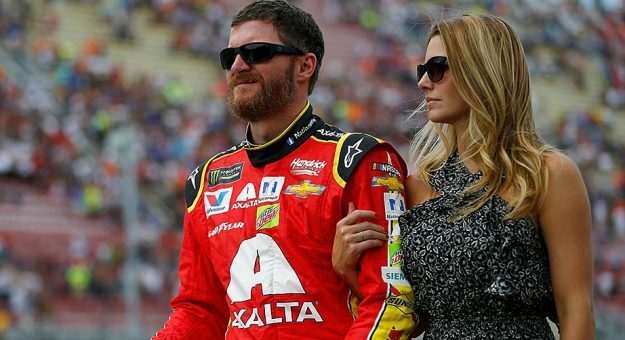 By now, everybody knows that Dale Earnhardt Jr. and Amy are expecting their first child, a girl. Naturally, fans on Twitter were quick to share their excitement with the parents-to-be. Part of that excitement was offering some suggestions for names for the little Earnhardt. From Amy Jr. to Dalamy to Mayo (really — it makes sense), here’s the best of what fans had to offer the happy couple. @DaleJr Dayle was a name option for both of my daughters. Just saying…..
Dale can be a name for a girl too. Hows Daleena or Dalamy for her name? @DaleJr I have a feeling that Charlotte will be in the baby’s name. Congratulations to you and @AmyEarnhardt! @PPistone @TheMikeBagley #TMDNASCAR would it be socially acceptible for @DaleJr to name the baby girl Dale the 3rd? Congrats to Dale and Amy!!! Elizabeth is a nice name for a girl. OK — while help from fans is sometimes a good thing, maybe it’s preferable that Dale and Amy get final say over their daughter’s name.